Animals’ lives are much more in the present than most humans, and they do what must be done each day to survive: find water, get food, have shelter. The animals possess an actively accessible historic memory,stretching back millions of years in their DNA, kept alive in their own councils of teaching, in their ancient routes, hunting and breeding practices, shared down through their generations among their own kin and with human allies, such as shamans, medicine men and women, and animal communicators. Neither the extinction of the dinosaurs and their contemporaries nor the last wave of extinctions 12,500 years ago was due to overhunting or overpopulation of Homo sapiens,though like any co-residency,larger species take up more space,use more natural resources, and their own overpopulation was a greater issue than human overpopulation at that time. Animals of our ancient past did not die off from human overpopulation or predation,but from off-planet impacts that are part of Earth’s 2.5 billion year old history, primarily a giant comet that broke into pieces as Graham Hancock points out (Magicians of the Gods, 2015), hitting our northern latitudes and ice caps worldwide, and causing global flooding. Galactic core explosions in our ancient past changed the weather dramatically not just for a few months or years, but across generations of time. According to plasma physicist, Dr. Paul Laviolette, galactic core explosions happen every 13,000–26,000 years,along with the precession of the equinox. When one species fails to thrive on earth, other species take their places. This is the animal perspective. The weather as we know it has been quite stable for the last 8,000 years. Obviously this is now changing. We are in what is being called the Anthropocene epoch, which is a mini-Ice Age within the larger Ice Age cycle, where human activity is largely responsible for the accelerated die off of species. This is a call to action and it is the animals that are calling humans to council. We are beyond the tipping point. The mythological dragon is a good example of how extinction may actually be transformation. The Komodo dragon of today, native to Indonesia, while it can grow up to ten feet and weigh 150 pounds, certainly reminds one of the tales of enormous legendary flying dragons but is hardly their scale. The historic dragon, whose wingspans were said to have been as wide as 25 feet, are well represented by skeletal remains of an extinct sea bird, Pelagornithid, found in 1983, when Charleston International Airport was undergoing expansion. The skeletal remains were so enormous that they had to be dug out with a backhoe. These great birds (flying dragons), to which the Condoris related, lived 25-28 million years ago. Of course there were flying dragons, every child will tell you this is so, and so do the animals of ancient memory and many cultures of the world. Today, these huge, fire-breathing dragons remain in our psyche as evidenced by modern films and cartoons, but there is no question in my mind that there were dragons on Earth in the past and that their relatives exist today in smaller form on the physical plane. In another example, consider the 4,400 lb giant Ice Age Bison who flourished millions of years ago, and their smaller progeny at 1,000 pounds less than that, who came on the scene 250,000 years ago. Then, 20,00 to 30,000 year ago, there was the Wisconsin Glaciation, and the smaller Bison Occidentalis went extinct, giving birth to our beloved American bison, the buffalo as we know them today, which weigh 2,000 pounds. These cycles seem to be more about changing the scale of life forms than ending all life on earth. My own hypothesis, and which the animals agree with when asked, is that as we re-ascend the ladder of light over the coming millions of years, from a dense material state to a less dense one, it would seem smaller life forms will make the transition more simply. Perhaps all of these extinction cycles are for lessening the physical mass on Earth in order to prepare our DNA and life systems for light bodies, instead of the more dense material ones we currently require, allowing us to return to our origins, as spiritual beings of light. From the animal species’ point of view, extinction is not really extinction but transformation. Every epoch, every civilization has its own expressed form. If all things are related in octaves of similars as ancient mystery traditions teach, then a two-ton animal of any kind is still related to its smaller version which may weigh less than a 1,000 pounds. So too with the dinosaurs and other large creatures that died off in the last Ice Age—they have their offspring or species that carry some of their genetic mapping, and they thus serve their purpose in contributing to the gene pool in this way. Some Ice Age animals, fish, and other wildlife have survived, which, I believe, Big Foot (also called Seti,and Sasquatch) is evidence of. Chessie of the Chesapeake Bay waters and Scotland’s Loch Ness Monster are two other examples. Only five percent of America’s wilderness remains, but our oceans are full of life forms we know nothing of, have never seen, and which may contain survivors of our last Ice Age. So too, in the great rainforests and other unexplored regions of the world, cryptozoologists (those looking for lost or hidden animals) regularly discover ancient or new and amazing species. In today’s sixth extinction however, human activity has accelerated extinction rates beyond the background normal one would expect to see. This extinction epoch will be in large measure the result of human activity or inactivity depending on the situation. So what do these great, majestic, colossally large animals of the past ages have to say about the Ice Age?“It was cold, for many generations.” There is not a single glacial animal that does not speak to the overwhelming cold, the challenge of finding food and shelter,and the ongoing sense of time slowing down. The larger creatures were also too big to keep repopulating and be supported by the ecosystems. To say they provide the gene bank for today would be a good way to think of them. Just as the galaxy is changing, so too all life on Earth is changing. New life forms may be more compatible with using fewer resources, and perhaps need lower oxygen levels as well. Our ancestral Ice Age mammals still live among us in their smaller scale as Elephants, Lions, Bison,Wolves, Whales, and Bears, and share with us the same story of potential survival or possible annihilation. To save the capstone species is to save ourselves. This is the time for humanity to accept the inheritance of our very ancient past and our planet’s indigenous peoples’ wisdom,which the animals are calling us to do. They say we are to remember we are ALL ONE regardless of species, place,or time. All of life has a purpose and all change is for the eventual good of Creation. Humans are reawakening to our animal kin as our helpers and collaborators in Earth life. Viewing Earth as an exploitable commodity, versus a shared resource, is the complex root of our psychosocial imbalance. Unlike the hunting, herding,and agrarian settler communities of the past and in communities planet wide today, the technological age encourages us to return to the wilder nature within our hearts, to appreciate the natural seasonal reality of limited shared earth resources. “Take only what you need,” is the animals’ exhortation to us, and“Share what you have with others,”as they do. 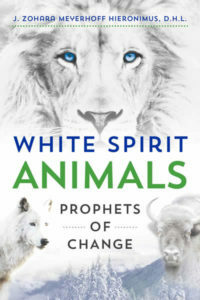 After communicating with them for a number of years,the White Spirit animals shared with me a surprising wisdom teaching,“Pay respect to your elders and honor matrilineal traditions for preserving species’ cultures, wisdom,and offspring.”Humanity’s habit of disassociation has caused us to do things that are not in the Earth’s interest or our own. Rather than viewing nature and animals as exploitable commodities, humanity needs to awaken to our shared stewardship, as White Wolf taught me in a dream riddle, “The Earth needs CPR: Conservation,Preservation, and Restoration.” It’s a wonderful mantra worth reciting every day, and which I urge you to repeat and share with others of all ages. It’s a unifying banner that includes everyone.